I know all y’all are trying to get that #1 hit and all that but if you’ve ever thought about scoring music for film or TV this may be something for you. Lots of work out there for that type of thing. Sorry for the last minute notice though…didn’t know the application deadline is next week so get on it! Here’s more info and link to the application info is below too. 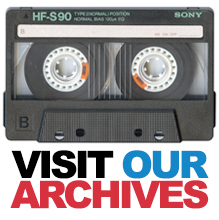 Over the last 25 years, CFC has trained and launched some of Canada’s most exciting and prolific storytellers, while fostering strong relationships and providing many showcase opportunities for our music community. 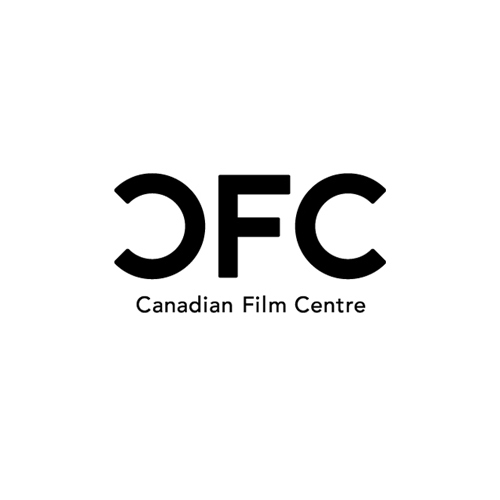 As we look to strengthen our relationship with onscreen talent, we recognize the need within our industry for more in depth, professional onscreen musical training that would adopt the same approach to nurturing talent that is the hallmark of CFC’s programs. The Slaight Music Residency is aimed at composers and songwriters looking to break into the onscreen world, and will support musical artists (composers & songwriters) each session. Another year and another dope music industry conference from The Stylus Group, presenters Slaight Music, and partners Manifesto, and the A&R Report. Your boys will be moderating a panel on artist profile development and PR strategies + interviewing the conference’s keynote – Atlantic A&R V.P. Kawan ‘KP’ Prather (Dungeon Family, Outkast, Usher, John Legend). It all jumps off tomorrow (Saturday, June 8th @ 12:30pm). Full details below. John Legend, T.I. 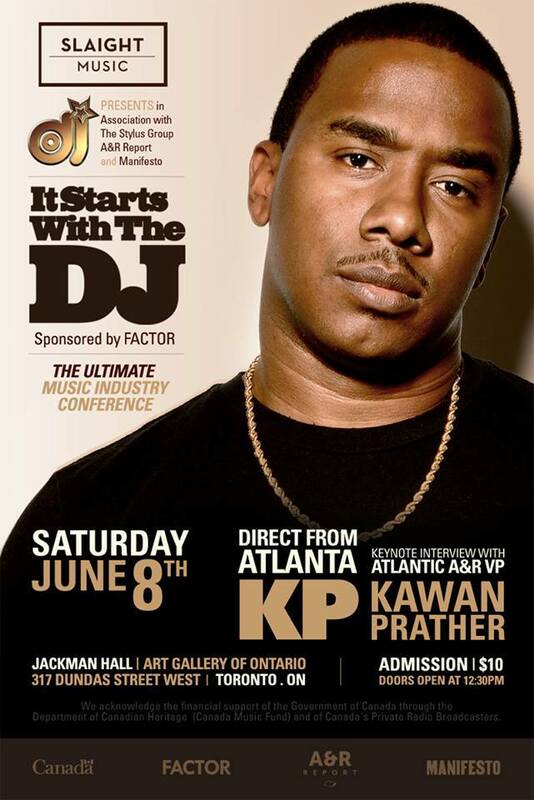 Outkast, Usher, TLC, P!nk, and Yelawolf are some of the artists whose careers have been orchestrated by famed music industry executive and producer Kawan “KP” Prather – Urban A&R at Atlantic Records who will join the 2013 It Starts With The DJ conference as the main keynote speaker. The conference will feature a power panel of Toronto’s best in the media relations business held in Toronto on June 8th, 2013. Held at the Jackman Hall – Art Gallery of Ontario (317 Dundas Street W.), the McCaul Street entrance will open at 12:30 pm, with tickets available for $10 CND at the door. The sixth annual It Starts With The DJ conference is a prelude to Stylus Spinfest Weekend taking place in the Fall 2013 involving three-days of celebratory events leading up to the big Stylus Awards show finale. This interactive discussion will focus on the world of public relations and the importance of connecting directly with various media outlets. The panel will feature some of Toronto’s well respected publicists, bloggers, and diverse writers, who will explore their outlook on today’s industry and the inside scoop on how to engage the media. This segment will provide a forum to introduce musical artists to the steps in establishing the right PR strategy to build their profile. A few topics on the agenda include: The steps to approach various media types, what do writers care about, and what not to do to burn your bridges. Direct from Atlanta we sit down for a conversation with successful A&R Record Executive Kawan “KP” Prather. This unique keynote appearance will dive into his outlook on today’s urban music industry and offer an inside look to his entrepreneurship and business philosophy as he shares insights of his music career over the years and stories behind some of the industry’s most celebrated artists that he’s worked with throughout the decades. Offering advice and motivation, along with the tools to inspire. Back by popular demand, we’re dedicating one hour to the importance of networking. Unfortunately, many musicians do not have relationships with key industry executives and this creates obstacles in receiving exposure. Participants have the opportunity to book in advance a five-minute session with up to three of our influential advisers of their choice, to receive feedback or advice on current projects. After the first five-minute session has completed, participants will proceed to the next scheduled session and continue until all sessions have been completed. One on One relationship building sessions can result in the best of outcomes for a chance to network in a more intimate setting, and open the door to properly strategize next career steps. Dope initiative from a new local clothing company called AEON Attire. Basically they’ve got these really nice circle scarves and if you buy one they’ll be donating one to a homeless person in need. Check out the scarves here and help support a great cause. Have you ever been cold? Have you ever felt the harsh winter wind numb your face, neck, and hands? In times like these, we throw on another layer or go home to regain feeling… but unfortunately, many don’t have this option. 1,000,000 Canadians are homeless at some point each year, and a third of them are youth. This winter, many people will seek survival in the next bus stop, alleyway, or shelter—if there’s room. This lack of warmth leads to frostbite, hypothermia, depression, obstructs day to day activities, and prevents finding a way out of homelessness. This creates a vicious cycle for individuals who are trying hard to get their lives back on track. The last thing they need is to worry about the cold. That’s where YOU come in. Introducing the Full Circle Project by AEON Attire. For every scarf you buy, we donate a brand new one to those in desperate need of warmth. Now, your everyday purchase means dramatic improvement in your community. Shop online now, get a brilliant scarf in one of three styles, and share your warmth in a full circle. Fundraiser for the families of Gaza & Syria. In light of the unfortunate, current climate in these regions, we are coming together to raise money. 100% of the proceeds will be donated to the Palestinian Red Crescent Society and UNICEF. With your help, we will provide Medicaid, Food, and Shelter. By the people, for the people. 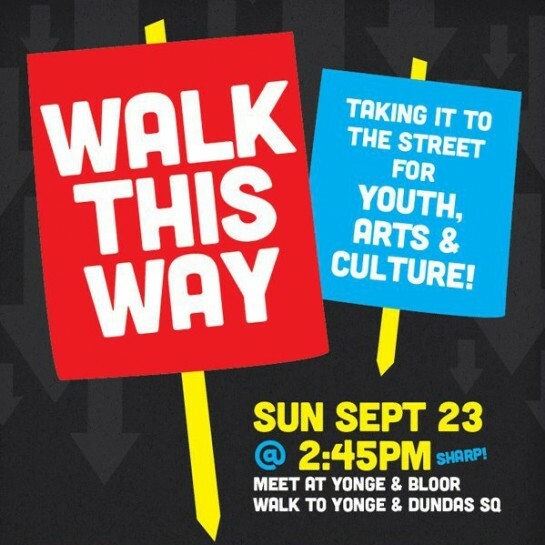 If you’re looking for me today you can find me here with many others..
On Sunday, September 23 Youth Arts Organizations from across the city will come together to march in solidarity from Yonge and Bloor to Yonge-Dundas square. We are inviting all supporters of Youth, Arts & Cultural programs to come out in support of these programs that help build a vibrant city. The march will begin promptly at 3 p.m. with the goal of arriving at the youth arts festival, the 6th Annual Manifesto Festival of Community and Culture ‘Live at the Square’ by 3:45 p.m. Celebrate the value of Youth, Arts & Cultural Programs in building healthy, empowered and resilient individuals & communities. Appreciate the energy and innovation of youth arts programs and the crucial role that they play in connecting our city. Recognize the 20th anniversary of Fresh Arts and other foundation community programs and the value of young people in all parts of Toronto being able to tell their stories. Develop, discuss and review ways to stabilize investment in young people. Bring your artistic expression, rally your communities and add to a collective energy as we move down Yonge Street into Manifesto’s Live At The Square – an annual youth arts festival happening that day. Calling out participation from dancers, poets, street writers, emcees, beatboxers, visual artists, documentarians, drummers, percussionists & more – it’s time to write our story ourselves. This is pretty much the only place to be today (Saturday September 22nd) for those looking to discuss Toronto’s past, present and future history of empowerment, expression, inspiration and commerce through art. ip hop festival) and will begin at 12:30 p.m. at Ryerson University’s George Vari Engineering Building. The electrifying lineup of key speakers will include Jully Black, Kardinal Offishall, Shad, Solitaire, Rich Kidd and notable American rapper Pharoahe Monch. The conference will kick-off with a keynote panel titled “Art is Power- A Dialogue on the Transformative Power of Art”, moderated by popular radio host Mark Strong and led by industry leaders Kardinall Offishall, Pharoahe Monch and poet and educator d’bi Young. Additional panel discussions will include “Toronto Generations, Knowledge is Power, Then & Now: 20 Years of Hip-Hop” and “The Art of Business” will run throughout the day between the hours of 2:45-7:30 p.m. The Summit’s mentor classes will provide an enlightening learning experience for attendees both young and old. The classes will be held between the hours of 4:00 p.m. and 5:30 p.m. with a second set of classes being held between 6:00 p.m. and 7:30 p.m. 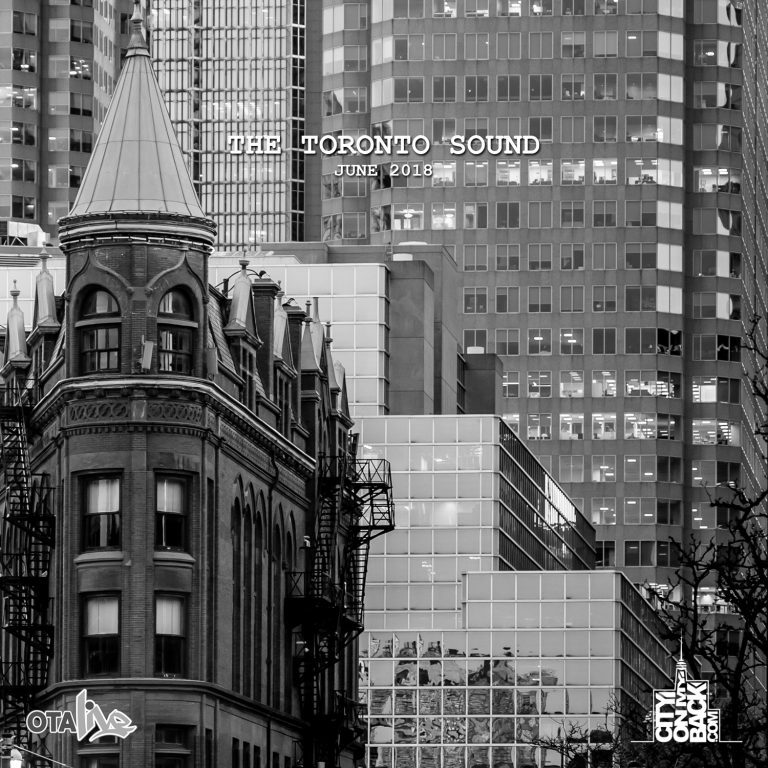 The classes will provide perspective on the topics of the Art of Music Production, Spoken Word, Film and Video Direction and the Art of Performance, taught by groundbreaking artists Jully Black, Shad, J-Wyze, Rich Kidd, Cazhhmere, Quentin Vercetty and Solitaire. This one-of-a-kind experience is part of Manifesto’s goal to bridge the gap between the artists their performances and the messages, stories and motivations behind their expressions. 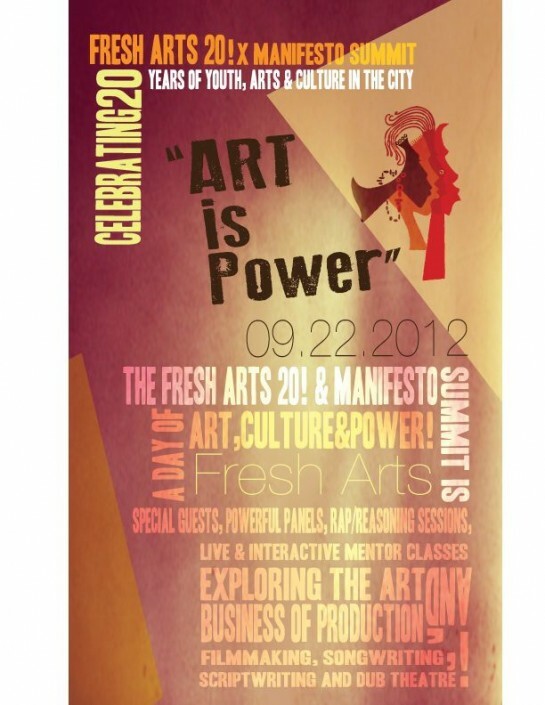 The Fresh Arts 20 x Manifesto Summit plays a key role in integrating a shared experience that not only challenges the status quo from a grassroots perspective, but to also help write the next chapter in hip hop’s discourse through group dialogue. 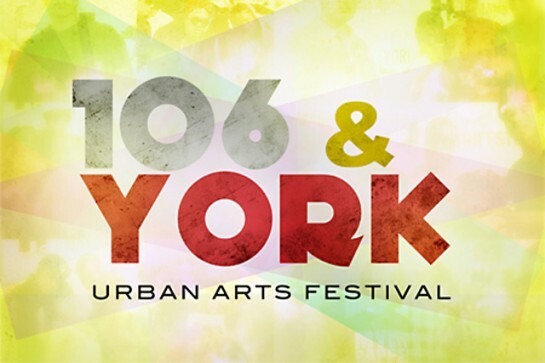 (Toronto) 106 and York UrbanArts Youth Festival is an annual multi-disciplinary youth arts festival that happens in Toronto’s North-West communities. Now in its fifth year, this community event has grown from a one-day production, to a two-date festival, celebrating the talent of performers and visual artists from across the city. 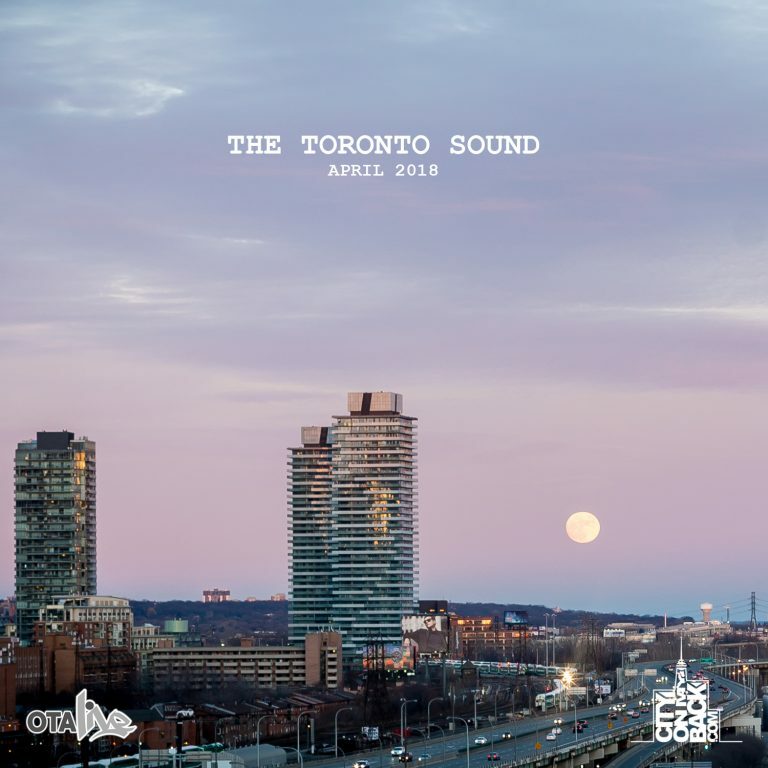 Headliners for this year’s events include JD Era, (signed to the label of Raekwon, of the legendary Wu-Tang Clan), Juno-nominated Producer/MC Rich Kidd, one of Toronto’s most exciting new vocalists, Shi Wisdom, and more. Shi Wisdom is the headlining performance for this free outdoor community concert. Join us as F-YOU: The Forgiveness Project discusses “retaliation” to current violent events in the city. Tuesday, June 12th 2012. 7:00pm sharp. Guest speakers include family members of murder victims, front line social workers, entertainers and members of the media. Forgiveness is not permission, or predisposed justification – it is the release of detrimental feelings, thoughts and emotions that can consume us. 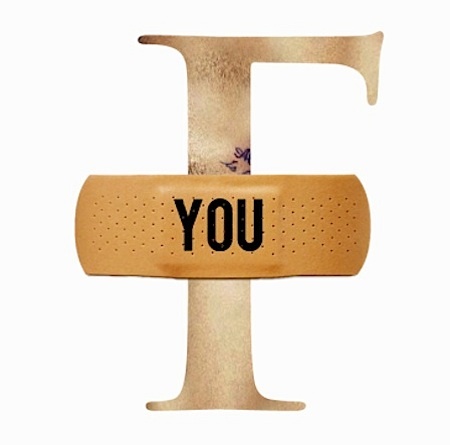 F-You: The Forgiveness Project is an impassioned and inspiring event, featuring speakers who have overstepped the line between being a victim and being a survivor in the face of their own internal adversities. The F-YOU Project has been called “life changing” by the Toronto School Board and is set to be featured on Oprah’s OWN Network in July 2012. Supported by: Gravity Affect, IMMNF, Heeling Soul, HipHopCanada, GYC and many more. The Lost Lyrics initiative celebrates its 5th year with a dope viral campaign leading into their 2-day, alternative education conference (congrats!). 2012 marks the 5th year of existence for Lost Lyrics and to celebrate this anniversary we are organizing a 2-Day Conference entitled: The Roots of the Rose. Inspired by Tupac Shakur’s poem The Rose that Grew from Concrete, this conference will explore what it means to build an alternative education movement from the ground up.